Matt Damon Strolls With His Big Apple Babe! Home » Matt Damon Strolls With His Big Apple Babe! 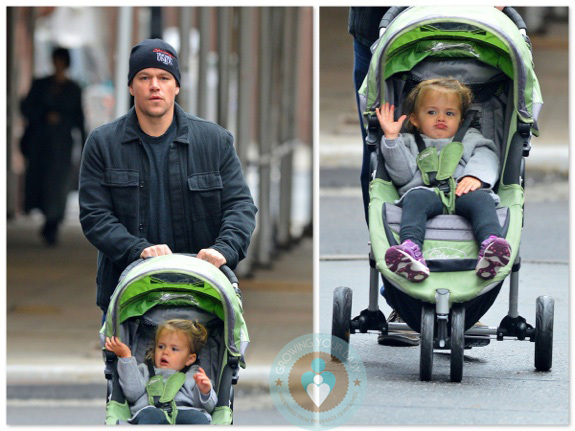 Matt Damon was photographed out for a stroll with his youngest daughter, Stella Damon, in SoHo on Tuesday. The actor was back on daddy duty after a Birthday party weekend with some of his celebrity friends in London. Page Six reports that Matt was joined by Tom Cruise, Chris Hemsworth, Emily Blunt and Bill Paxton at London club The Box to celebrate his 42nd birthday. With 4 kids at home and 3 movies in the can for the year, we think he has earned his right to party on his birthday! Happy Birthday Matt!